In the global War on Terror, among the greatest threats to the United States military are insurgent uprisings. 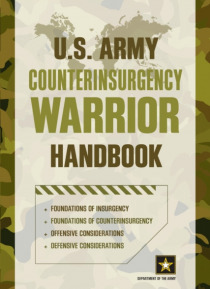 Enter the U.S. Army Counterinsurgency Warrior Handbook, the counterinsurgency playbook used by the greatest army in the world. This manual establishes fundamental principles for tactical counterinsurgency operations at the company, battalion, and brigade level. It is based on lessons lear… ned from historic counterinsurgencies and current operations. The realities of today's operational environmentan environment modified by a population explosion, urbanization, globalization, technology, the spread of religious fundamentalism, resource demand, climate change and natural disasters, and proliferation of weapons of mass destruction. Both a boots-on-the-ground field guide to defeating an insurgency in a nation where the U.S. military has oversight and a high-level leadership guide for commanders organizing counterinsurgency efforts, this bookwhich includes battle diagrams and illustrationsis not only a must-read for military buffs, but also a valuable resource for business and gaming strategists.